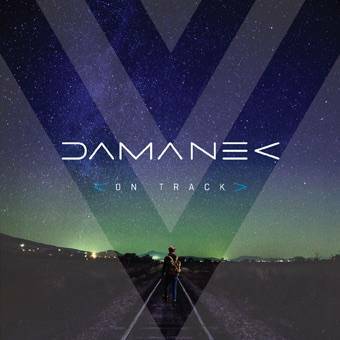 Damanek is an all-star musical project, which is the brainchild of composer, musician and vocalist Guy Manning. He has surrounded himself with some of the current cream of the prog to help him deliver one of the most thoughtful albums of 2017. The immediate band comprises Manning, Marek Arnold on saxes, clarinet, keyboards and SeaBoard, Dan Mash on bass and Sean Timms on keyboards and backing vocals. Guest artistes are equally illustrious, headed by Luke Machin on guitar and Nick Magnus on keyboards. Also on the guest list are: DavidB, Kevin Currie, Julie King on backing vocals, Chris Catling on guitars, Phideaux Xavier on vocals, Stephen Dundon on flute, Brody Thomas Green and Ulf Reinhardt on drums, Tim Irrgang on percussion, Antonio Vittozzi on electric guitars plus The Santucci Horns consisting of Eric 'Tooch' Santucci on trumpet and Alex Taylor on trombone. The themes of the pieces included here are, for the most part, apocalyptic, a catalogue of the ills of man and how they are impacting on the world around him. But each of the eight songs are beautifully crafted and performed. A pacy rhythm begins Nonabahza And The Rainbow, that pays homage to Native Indian culture through tasteful keyboards, glorious guitar and lovely orchestration. It is full of interesting twists and turns, alighting on a strong Eastern sounding passage, piping soprano saxophone and a penetrating guitar solo. Long Time, Shadow Falls has a slightly lighter, airier feel to it, bringing us into the heart of the Kalahari Desert to take the part of the animals against the poachers lyrically. The track's initial lilting melody intensifies through dramatic keys before a jazzy guitar and funky organ kick in and propel it into an entirely new direction. Manning's vocals sound like a choral ensemble and just for good measure, a guitar solo by Luke Machin gives it another dimension. Manning's voice is underpinned by piano at the start of The Cosmic Score, whose arrangement has been created by Nick Magnus. It's another gorgeous atmospheric show-stopper that dwells on the wonders of the night sky and which showcases Manning's unique voice to perfection. Another beautiful Marek Arnold soprano saxophone section further enhances one of the best songs of the year. Believer Redeemer has a great jazz-funk vibe, bolstered by a wonderful brass section and some shimmering keyboards reminiscent of Bob James, creator and performer of the theme from US comedy series Taxi, plus Dan Mash's sublime bass. This is another cracking track. We're back on African soil for Oil Over Arabia, an elegy to the horrors of the wars waged for fossil fuels that crackles into life with insistent piano and guitar, followed by suitably Eastern saxophone motif and wonderfully “out there” electric piano solo. You can almost see the sand dunes and oil pipelines materialising in the distance. Big Parade has a real 1920s Vaudeville feel, Manning's voice sounding as though it is being channelled through a megaphone. A full mix of brass, clarinet, banjo and ragtime piano is a great disguise for the more serious message of the lyrics. Madison Blue is a plaintive piano, voice and orchestrated song, a sad ballad-like lament about leaving and loss that really hits the spot when Stephen Dundon's beautiful flute comes in. Dark Sun is the piece de resistance, a sombre, brooding elegy about air pollution and the threat it poses to the future of mankind. There's a gradual building up of the tempo and Manning's vocals are high up in the mix along with accompanying backing vocals. There's some lush orchestration and poignant saxophone before it takes off and flies away, the urgency of the guitars and rumbling bass elevating it to another dimension before a jazzy piano sequence comes in. The song slows down as the guitars soar higher and higher against almost hymn-like keyboards. I absolutely love the way this album flows in its understated way, the musicianship peerless throughout. The sequencing of the tracks is spot on and Manning's vision as composer, performer and lyricist has never been more perceptive. This is right up there as one of the top ten albums of the year contenders.